Construction and Demolition (C&D) debris makes up 5.4% of the total waste going into landfills across Iowa, according to the 2017 Iowa Waste Characterization Study. C & D debris includes materials such as concrete, asphalt, brick, wood, metal, insulation, drywall, flooring and roofing materials. The Black Hawk County Solid Waste Management Commission encourages residents and businesses in Black Hawk County to properly manage their construction waste and to recycle home improvement materials, when possible. * Asbestos containing items require special handling and disposal. The Iowa Department of Natural Resources also maintains a helpful list of state and national C & D debris related resources. An estimated 12 million tons of shingles waste goes to landfills in the United States every year, but they can be recycled! Shingle recycling is the process of taking asphalt shingles from roof tear-offs and collecting them for reuse into another products. Shingles are ground and incorporated into asphalt for paving roads and parking lots. The City of Cedar Falls received funding from the Iowa Department of Natural Resources Solid Waste Alternatives Program (SWAP) to install a concrete slab and concrete barriers to efficiently collect clean shingles (*can include nails and felt/tar paper) from roofing projects and contractors. Cedar Falls offers this program through the Cedar Falls Transfer Station. Building materials, flooring, cabinets, fixtures, toilets, furniture, and more! Renovating your home? Updating faucets, light fixtures, doors, or windows? Have extra supplies from your recent home improvement project? Did you over estimate the amount of paint needed for a project and have unopened/full cans left over? Buy too many flooring and roofing materials? Iowa Heartland Habitat for Humanity ReStore focuses on keeping quality, usable building materials out of our landfills. ReStore accepts new and used material donations from individuals, retailers and contractors, and then sells those materials back to the general public at deeply discounted prices in their store or through their Ebay Store. Store proceeds help fund Habitat for Humanity projects in the Cedar Valley. Old copper wiring, aluminum siding, brass fixtures, rusty steel shelving, and different types of scrap metal items can be recycled! Look for scrap metal recycling companies listed in the yellow pages of the phone book under “Scrap Metal – Process & Recycle”. Many companies may even pay you for your metal. The Cedar Falls Transfer Station accepts scrap metal for recycling at no charge. The Black Hawk County Sanitary Landfill accepts scrap metal for recycling for a fee. There are several local companies that accept concrete debris, bricks, cinder blocks, asphalt, rubble, and sand for recycling or reuse. Contact the company directly for accepted materials and policy details prior to delivery. Click to view larger version in a new tab. 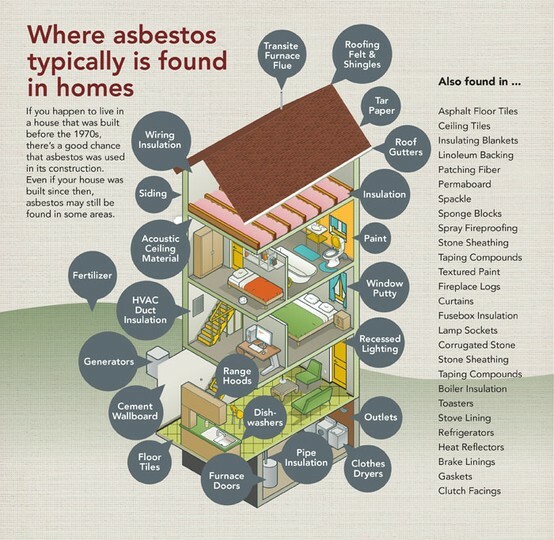 Asbestos is found in a wide variety of home materials, including slate siding, asbestos insulation, varieties of flooring, ceiling, and roofing tiles, etc. Asbestos containing materials are considered a “Special Waste” and require specific handling for proper disposal. Please contact the Commission Administrator for the Black Hawk County Solid Waste Management Commission at (319) 234-8115 for more information.